Physiotherapists are trained professionals who, on a daily basis, help clients deal with pain and movement dysfunction. As the profession has moved towards evidence based practice, the way a client's therapy is delivered has also changed. We are moving away from didactic teaching and anecdotal practices, to providing the client with interventions that are based not only on our clinical experience, but research. This has led to a shift from the biomedical model to a more client centred biopsychosocial approach. This has been influenced by the recognition that emotional factors such as fear, anxiety and stress can delay and impede the recovery of those suffering from pain. While short term or acute stress can be beneficial, especially in a crisis, persistent or long term (chronic stress) can be physiologically damaging. In order to fully understand the shift in assessment and treatment approaches, it is important to understand stress, as well as how people’s behaviour and fears affect their perception and approach to pain, as well as their participation recovery. 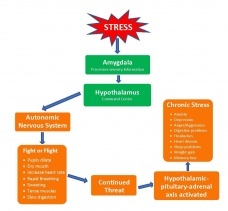 Stress is an emotional (and physiological) response to either a known or perceived threat and it can be categorised as either acute or chronic. 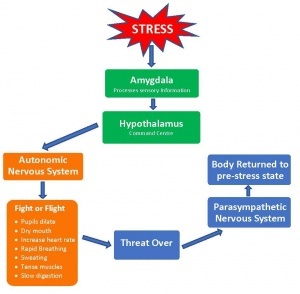 Acute stress can be positive, particularly in the face of danger as it provokes a fight or flight response. However, stress that is prolonged can be detrimental to our health and well-being. 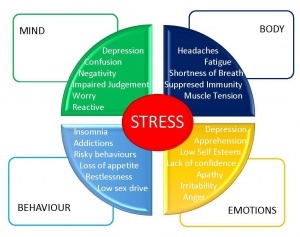 The impact stress has on health has received more attention recently, with the World Health Organisation recognising the need for strategies to help those suffering from various forms of stress. It has also recognised the increasing problem of stress in the work place, stating that it is becoming a worldwide epidemic. To better understand how this impacts physiotherapists, it is important to understand not only the biological and physiological response to stress, but also the relationship between chronic pain and stress and how it can influence individuals. 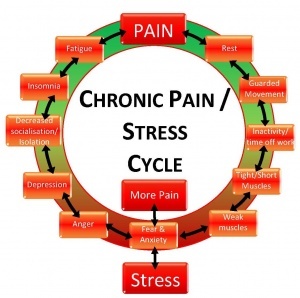 It has been established that chronic pain can contribute to stress and also that stress can contribute to chronic pain. The burden of of a long-term illness or disability can put a lot of emotional and financial pressure on a person. For instance, the worry of being unable to work, feeling excluded from activities, and feeling misunderstood can have a negative impact on the way a person sees their role within their family and society. Table 1 shows the link between chronic stress and pain. As mentioned earlier when discussing stress, it has been established that if a person experiences continued or chronic stress the stress response of flight or fight is not regulated. As a result, a new pathway for stress is developed and new memories associated with fear and behaviour are learnt. Chronic pain follows a similar pattern: movement and pain become associated with further damage although in most cases there is little evidence to support this. In fact, there is often no correlation between pain and the state of the tissues in persistent pain conditions. Moreover, movement and exercise can often be useful strategies in the management of chronic pain. Another link between chronic pain and chronic stress is the change in size of the amygdala; in both the amygdala has been shown to decrease in volume. 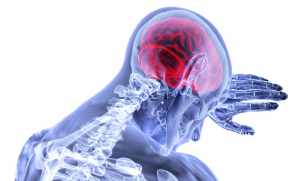 In a study undertaken to investigate the effects of chronic pain on the brain, 10 patients suffering from hip osteoarthritis were found to have an increase in amygdala size after surgery and the abolition of pain. The study concluded that the changes in the brain are not the cause of the pain but rather a response to pain. It is a complex area of study but there is no doubt that this is a connection between chronic pain and chronic stress; people's attitudes and responses can influence their participation and commitment to their rehabilitation programme. It is far more difficult to encourage a person in pain to exercise and move if they have fear behaviours and are also suffering from the effects of chronic stress. Physiotherapists along with other medical professions are taught to recognise the biological aspect of pain and dysfunction – anatomy, physiology and condition/problem based case studies, in class and in our working environments. An assessment which incorporates the biopsychosocial model can be a long and detailed process, which may be daunting. It requires the therapist to ask questions and pay attention not only to pain intensity and movement dysfunction and restrictions, but also to behaviours and beliefs. This can be a complex process and there are factors in place to guide the assessment and subsequent treatments. Physiotherapists are not new to using markers and signs to lead their assessment. A flag system has been developed to help identify risk factors in musculoskeletal disorders. Red flags were first introduced into practice in 1994 and are used to identify serious pathology. Since then other flags have been introduced to highlight potential barriers to treatment and rehabilitation. These flags help guide our management and approach and give insight in how to engage clients and improve treatment outcomes. Red 1994 Serious pathology, eg. Cognitive Functional Therapy developed by Peter O’Sullivan to assess and treat low back pain and Therapuetic Neuroscience Education are two new modalities that have been found to be affective when assessing and treating chronic pain conditions. Both of these approaches have grown from Cognitive Behavioural Therapy principals and although they are aimed at treating chronic pain, the elements that underpin their philosophies can be utilised and adapted for any acute or chronic condition seen within a physiotherapy department. It’s important to remember that a person’s attitude to their acute pain may lead to their pain becoming chronic. A client who is quickly encouraged to adopt a positive attitude and approach to their pain, will have a reduced risk of developing chronic pain. Focuses on how the condition impacts on clients life. The question is how effective are we at implementing these methods into our everyday practice? Sometimes the evidence, as great as it is, has limitations and barriers. To be an effective tool, there are certain criteria that have to be met. Understanding the model is of no use if you are not good at observing body language and reading between the lines when clients are talking. As well as these personal skills, there are other barriers. For instance, how do we persuade clients to change their attitude towards pain and movement when they have been given a specific diagnosis and have biomedical treatment expectations? Especially when their learned beliefs have been reinforced by their doctor's advice and internet research. So many people walk into the clinic with preconceived ideas and armed with a wealth of knowledge researched on the internet. If a client is convinced by these preconceptions, how effective can these methods be? If we manage to overcome these barriers and meet a patient presenting with signs of a psychosocial factor (yellow flag), do we feel we have the skills to help modify the client's behaviour or do we refer to another specialist professional?. There are many other barriers and limitations and it is not only our approach to assessment and treatment that needs to change, but the way that physiotherapy is delivered. We can no longer expect to treat multiple clients at one time or limit time slots to 20-30 minutes. We also need to consider privacy and confidentiality - how can we expect clients to speak openly and honestly if they are separated from the next client by a curtain? Physiotherapy has progressed in leaps and bounds over the last few years but to ensure that we continue to provide the best treatment for our clients based on current evidence we need to look at the bigger picture. Changes need to take into account not only our clients' environments and beliefs but also of our colleagues, managers and service providers. ↑ McEwan, BC. Stressed or stressed out: What is the difference? Journal of Psychiatry and Neuroscience 2005; 30(5): 315-8. ↑ Schneiderman, N, Ironson, G, Siegel, SD. Stress and Health: Psychological, behavioural and biological determinants. Annual Review of Clinical Psychology 2005; 1: 607-28. ↑ Meeus, M, Nijs, J, Van Wilgen, P, Noten, S, Goubert, D, Huijnen, I. Moving on movement in patients with chronic joint pain. Pain Clinical Updates 2016; 24(1).